A new study suggests that Saharan dust played a major role in the formation of the Bahamas islands. Researchers from the University of Miami (UM) Rosenstiel School of Marine and Atmospheric Science showed that iron-rich Saharan dust provides the nutrients necessary for specialized bacteria to produce the island chain's carbonate-based foundation. UM Rosenstiel School Lewis G. Weeks Professor Peter Swart and colleagues analyzed the concentrations of two trace elements characteristic of atmospheric dust – iron and manganese – in 270 seafloor samples collected along the Great Bahama Bank over a three-year period. The team found that the highest concentrations of these trace elements occurred to the west of Andros Island, an area which has the largest concentration of whitings, white sediment-laden bodies of water produced by photosynthetic cyanobacteria. "Cyanobacteria need 10 times more iron than other photosynthesizers because they fix atmospheric nitrogen," said Swart, lead author of the study. "This process draws down the carbon dioxide and induces the precipitation of calcium carbonate, thus causing the whiting. The signature of atmospheric nitrogen, its isotopic ratio is left in the sediments." Swart's team suggests that high concentrations of iron-rich dust blown across the Atlantic Ocean from the Sahara is responsible for the existence of the Great Bahama Bank, which has been built up over the last 100 million years from sedimentation of calcium carbonate. 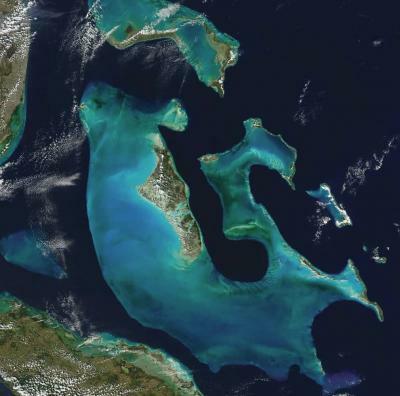 The dust particles blown into the Bahamas' waters and directly onto the islands provide the nutrients necessary to fuel cyanobacteria blooms, which in turn, produce carbonate whitings in the surrounding waters. Persistent winds across Africa's 3.5-million square mile Sahara Desert lifts mineral-rich sand into the atmosphere where it travels the nearly 5,000-mile northwest journey towards the U.S. and Caribbean. The paper, titled "The fertilization of the Bahamas by Saharan dust: A trigger for carbonate precipitation?" was published in the early online edition of the journal Geology. The paper's authors include Swart, Amanda Oehlert, Greta Mackenzie, Gregor Eberli from the UM Rosenstiel School's Department of Marine Geosciences and John Reijmer of VU University Amsterdam in the Netherlands. This is the Great Bahama Bank.